It seems the fun never stops being generated out there on the campaign trail. Last week, a friend sent along a “Hillary joke,” just one of several billion being spammed around the internets. “Hillary Clinton was out jogging one a.m. along the parkway when she tripped, fell over the bridge railing and landed in the creek below. Before the Secret Service guys could get to her, 3 kids who were fishing nearby pulled her out of the water. She was so grateful she offered the kids whatever they wanted. Ha ha ha. So his dad is a murderous brute; a cro-Magnon who rewards his own son’s act of chivalry with a crippling beating. Why is that funny? Because Hillary Clinton is such a horrible choice for president, certain types of people would supposedly beat their offspring into permanent paralysis for aiding her pursuit of the presidency of the world’s greatest democracy. Yeah, I get it. But it got me to thinking. Could a real knuckle dragger actually write a “joke” like that? Could they so ignore the fact they’re being encourged to hate in the name of preserving our current values of pre-emptive war for oil and to put the inferior Muslim religionists in their places— under the sand? Rudy Giuliani appeared to be out trolling for votes in a charming pink chiffon ensemble early one a.m. along the parkway, when he fell over the bridge railing and does a face plant with his enormous forehead in the creek below. Before the Secret Service guys could finish their hot-dogs, 3 homeless kids who were pan-handling nearby pull him out of the smelly, fetid water. He’s feeling pretty damned lucky, almost as lucky to have been mayor when 9-11 went down, so he tells the kids he is the living, breathing hero of the 9-11 disaster, and he’s running for president, and would like to reward the kids (in some cost-effective, self-aggrandizing way) with whatever they wanted. Rudy laughs good-naturedly and says, “Ah, so you’re a ‘Liberal! !’ Congratulations!” and immediately whirls and points to the third kid. 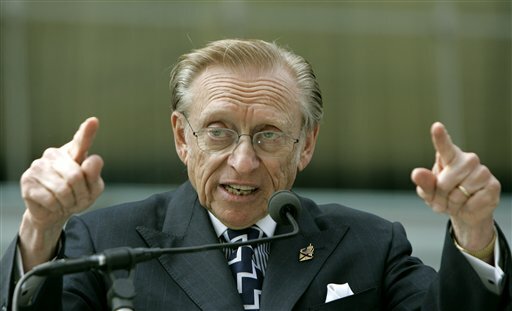 Larry Silverstein was out trolling for lucrative properties early one a.m. along the parkway, when he fell over the bridge railing and landed in the stinking wretched creek below. Before the punishing angels could get to him, 3 homeless vets, who were resting comfortably under the nearby bridge, pull him out of the filthy, polluted water. Larry felt he was so deserving of their act of heroism, that he told the vets he was the SEVEN BILLION DOLLAR beneficiary of the 9-11 catastrophe, and would like to give the vets whatever they wanted, provided it fell within certain tax-deductable limits. Larry said, “Ah, so you’re a conspiracy nutjob. Get outa here, head-case!” and his eyes begin to glow red as he glares at the third vet.